Here is my adorable little rolling home. I searched for about nine months before I finally found the one that just felt right. I think it is true when they say “You’ll know it when you see it.” I had stars in my eyes and birds tweeting around my head the minute I laid eyes on her. 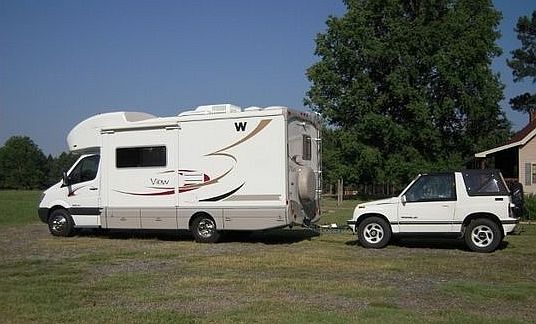 A 2008 Winnebago View 24J, with 31,000 miles, and a 1994 Geo Tracker tow vehicle thrown in for good measure. I am not one for making up a bed each day, so I was attracted to the J-model for it’s little “book nook” in the back. I love curling up on a Sunday morning with a book to nature’s sountrack. I am still working out the details of the office space. So far, the most comfortable spot seems to be in the drivers seat, swiveled back to face the coach. I haven’t come up with a good name for it yet. I never have been very good at naming inanimate objects, instead taking the obvious route based on color — “Little Orange,” my first car in college, “Old Blue,” my parent’s 1966 Impala, or “The White Wonder,” my brother’s Land Cruiser. So far, the two names that have been suggested are “Dora,” for “Dora the Explorer,” or the R/V Calypso, after Cousteau’s research vessel. I always loved that John Denver song, “Aye,Calpyso, the places you’ve been to…the things that you’ve shown us, the stories you tell…” Nothing has “stuck” yet, though. Suggestions welcomed! Hi, Suzanne. I LOVE your rig. How long is it? Last year my husband, daughter, and I spent 12 months driving around Europe and Turkey in an old 6-meter Ford Rimor, and we had plenty of space. Most rigs strike me as being too big…for my personal taste anyway. I miss camper life every single day. So happy to have found your site! Was checking out some of the blogs on Roxi’s Good Luck Duck blogroll and was immediately drawn in by the little I’ve read so far! Had to comment on your naming your rv. We started fulltiming in 2009 and walked away from it all, unprepared. Our first travel trailer we named “Ward” (he was a 1993 canadian brand called Award…so we separated it out…he was A Ward, of course!). Then a few years later we tried out a big 1993 Bounder motorhome…with the kangaroo logo, we named him “Joey.” (Should mention we also gave our rvs their own blogging voice, where they told our story). Recently, we made our final switch (our favorite) to an old 1993 pickup truck and 1999 Jayco 5th wheel, which we’ve named “Mr. Ed and Wilbur.” So we love hearing stories about naming rvs. Love the color themed names, by the way! What also drew me in is your passion for music. 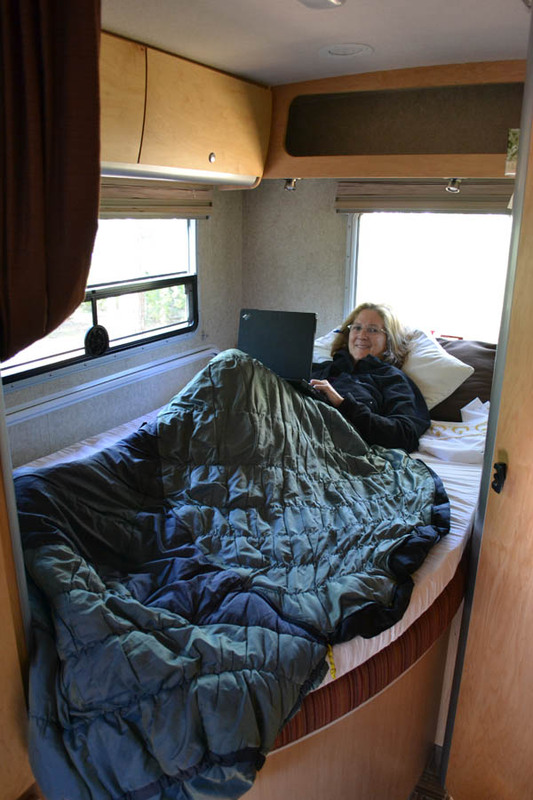 My husband and I have been an acoustic duo named “One Less Karen” since 1997, doing original tunes, and love every type of music…have it playing in the rv all of the time and find it extremely therapeutic, too. Didn’t mean to ramble on, but looking forward to reading through your amazing journeys and wanted to introduce myself (Robin) and my husband (Jim). Safe travels and nice to meet you! Hi, Robin! Thanks so much for stopping by and leaving such a nice note! I am a huge Roxi fan as well! I laughed out loud at “Mr Ed and Wilbur.” That is hilarious! I did at one time think of calling her “Silver” (Hi Ho, Silver, Away! from the Lone Ranger) But she feels a little too feminine for that with her red interior. Something will stick one of these days. Love hearing about your musical duo! I am going to go check out your blog. Thanks for the music support! Bandcamp has all 3 of our full length CDs in MP3 form and you can listen to every single song for free (just emphasizing, this isn’t a sales pitch whatsoever…it isn’t about the money, it’s about sharing the love of music)…they just have them with a “lower sound quality.” Given your passion for music, would love to hear what you think! They’re all on our One Less Karen website, if you have trouble finding them. So far, i have identified two “brands” that are ranked high .. Winnebago and the other is DynamX. Let me know what you think of the View. Any troubles? As crazy as it sounds, no, I had never rented an RV, and the only time I had towed a car was after I sold my home and most of its contents in Atlanta, and drove back to Texas towing my Honda CRV behind the UHaul. I had zero experience until the day I wrote the check to the former owner! I did do about two years worth of research, though! I went to several RV shows and looked over all the different models (even the Hershey show which is billed as the “worlds largest.) 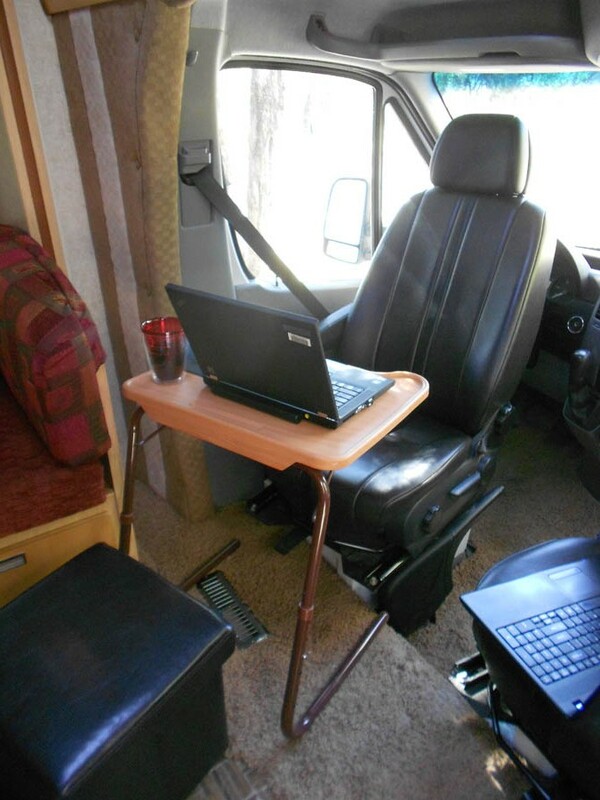 I also read a lot of RV blogs and forums like rv.net as I was making plans. The excitement I felt when reading about the experiences of others was like a “carrot” to keep me motivated through the “shedding” process. I was so very fortunate to have found my Winnie from a very helpful former owner who patiently taught me the towing details. He sold the RV and the Tracker together, otherwise I am not sure I would have had the nerve to tow. I had to jump in with both feet in order to get it home! I absolutely love the View more than I thought I would, and have zero regrets. Since it is built on the Sprinter chassis, it feels like driving a van. The only limitation I would say is exterior storage. But then if it had more storage room, I would only fill it up with more junk. haha! I am sorry I have not heard of the DynamX, so I can offer a comparison. My one bit of advice if you are considering the View is to join the View-Navion Yahoo group. I learned so much about the opinions and experiences of other owners before I ever owned. Good luck to you! I am having the time of my life! Suzanne, how about Molly Brown? There is an old musical out about her making her fortune in Leadville Colorado and moving to Denver at the turn of the century. The high-brow society snubbed her because of all the flashy gold and red velvet in her Denver home. She was also “unsinkable”!! 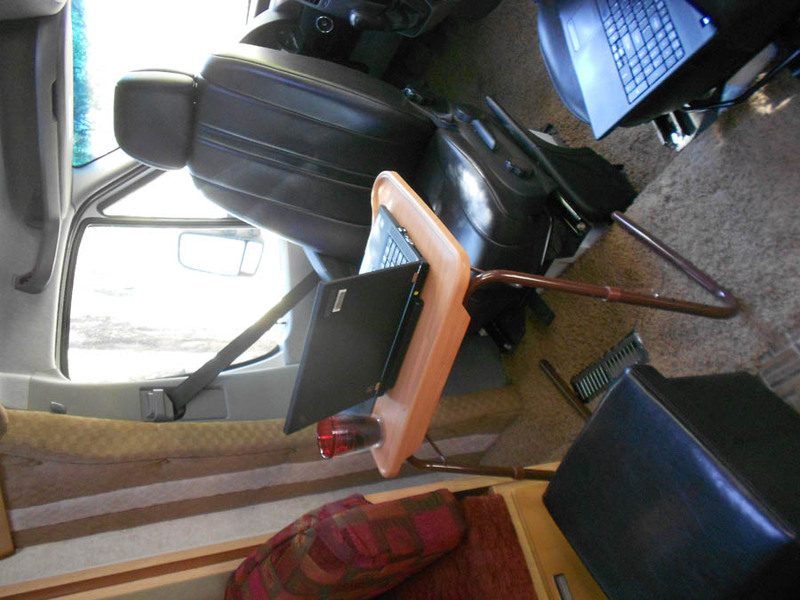 I wanted to see if you had pictures of your RV … and well… a tab that said RV … ha? love it… in the sticks of Arkansas? dang! I’m close to the sticks… why can’t I find such a wonderful thing… did you find this on craigslist? or how? Hi, Carolyn, yes, he was about an hour outside of Texarkana. I tried to find the name of the town, but I can’t remember. Seems like it was “Little” something-other-than-Rock. Way down a gravel road. I told Don, “well THIS can’t be good! !” Thought we were going to a fish camp! But the guy had a beautiful farm, and had the RV stored in a giant metal shed. I found it on RVTrader.com. If you have never used this site, it can be very handy. You can build a search and save it. So you can tell it the year, the model, whatever, and once a week, it will bring back any new listings. That is how I found it. Keep focused on those intentions, and the right one will show up! Nice rig. Love the book nook. I once had two burros. The brown one I named Brownie and the grey one, you guessed it… Grady. I have a white safari van named Kelvinator, because it looks like a big refrigerator. Thanks for the nice comment, and for stopping by the blog. I had a look at your “Betsy,” and she looks like quite a classic lady indeed! I would have probably gone with something a little smaller if I didn’t need the space to work inside. Very nice, she is! Your list of National Parks really helps… as they are all on my bucket list… time willing. I have no blog, not sure if I will but thank each and every one of you who do because of the wealth of information you furnish the rest of us. Perhaps something a bit unconventional? How about “Peregrinus,” the Latin word for wanderer/pilgrim? The Spanish, if you prefer, would be Peregrino. Where do you carry your bicycle? Hi, Marie — Thanks so much for the comment! I love the name “Lupita!” Can’t you name the new rig “Lupita Too!” 😉 How exciting that you are getting a new View. Which model? Mine is the J. I tried several names…Dora (for Dora the Explorah) Calypso, (for the female counterpart in Homer’s Odyssey and also Cousteau’s Research Vessel “RV”) and finally “Miss Scarlet” for her southern routes and red interior, but in the end, she is just “The Winnie,” and that’s good enough for me. 😉 If you haven’t discovered the Yahoo “Skinnie Winnie” forum already, be sure to do so…everything you could ever want to know about our rigs! I tow a small car, a GEO Tracker, so I have a Thule spare tire mount for the bike. I hate that it is out in the sun all day every day, but it is the best option I have found so far. Hey Robin and Jim. I just bought a 1993 Award 727 to go travel with my 2 dogs, 3 cats and pet starling. I travelled around the country 19-23 with a boyfriend, hitchhiked around Europe by myself at 26, did many other trips, moved to Montana and now I plan to travel again. Starting a blog/memoir titled “Destined to be an old woman with no regrets “!!! Hi, just found your blog after seeing on FB your link to the clever Jbed storage mod. We have exactly the same RV, bought in June 2013 from a Craigslist seller who had placed a (maybe too-) terse ad (title was “2008 24J”). It had ~32K miles on it. We are very happy with it. Thanks, Steve, but when you start carrying your raw sewage around with you everywhere you go, you will understand my desire to steer clear of anything with the word “pooh” in the name! haha!! Hi I’m Scherry from Texas. I close on selling on my house on the 22nd of this month. I’m soooo glad I found your blog. For months I have struggled with what I need to buy a fifth wheel travel trailer or RV motorhome I now have decided on the class C 24. Ill eat traveling with 3 fur babies but I think we will all fit. I already have a Tracker named JELLY BEAN not sure how to tow it because I worry about swaying. I don’t have a plan on where I’m going but since I’ve never been anywhere I don’t guess it really matters. I’ve kinda looked for someone I could tailgate with until I learn a few things. What I do know is I’m not goi g to waste the rest of my life watching the world on TV. Hi, Scherry — Thank you for the nice comment. The Tracker is the PERFECT vehicle for towing, as long as it is 4-wheel drive. I am not sure if you can tow the 2-wheel drive models, so be sure to check that first. Swaying is not an issue. The Tracker tows like a dream. I usually keep it about 62 mph on the freeway and have no swaying problems. Two things you will need are a tow bar (mine is Blue Ox) and a braking system (I use the SMI Stay-in-Play.) Both of those are expensive items, but they are only one time purchase and both have a fairly good resale value if you decide you don’t like towing. I get just under 15 mpg, but then my View is a diesel, which typically gets a little better mileage than gas. Though what you save in fuel costs can be countered with maintenance costs which are higher with a diesel. Unfortunately it’s all a trade-off! As for “tailgating,” well, there are so many organizations out there for single people who like to travel together. The WINS is probably most popular (Wandering Individuals Network.) Another one is the LOWS (Loners on Wheels.) The Escapees club also has “Birds of a Feather.” So there is plenty of company out there when you want it. Good luck to you! I hope you find life on the road as fun as I do! I had another question. How is your gas mileage ? We travel the hot Arizona area and found the factory A/C could not cool the driver, passenger cab area to our comfort zone. My wife stuffed about two feet of blanket under the cushion of the top sleeping area and then draped the blanket down behind the back of both driver and passenger chairs. Wow what a difference. The cold A/C air stayed in the cab area and I could turn down the fan yet keep temperature cool. My new View is a Mercedes Sprinter Chassis and when I drove it home 100 miles from Indianapolis to Louisville, KY, the song OH LORD WON’T YOU BUY ME A MERCEDES BENZ, kept going through my head so I’ve named her Janis (Joplin). I am towing a canary yellow Fiat Sport named Tweetie. Can’t wait to get out on the road with you. Thanks for following, Betty! And congrats on joining up with Janis! One of my favorites! Hope to see you on the road. You should plan on attending one of the View/Navion rallys. Such a great way to meet some fun people! That’s on my list. I plan to find mentors wherever I go. Thanks for your blog. We have a 24 ft THOR Siesta RV that the hot Az sunshine has Oxidized the top front area above the cab. Any ideas on removing the oxidized area and giving it a nice shine that will protect it.